This is the second time I have made this for dinner. The recipe is from La Cucina Italiana. It calls for Speck which I hope someday to find at the deli counter. Again I used Capicola. Sweet and hot this time. I picked up some olives from the salad bar to add to the dish. The only thing the recipe does not mention is to save some of the pasta water before you drain it. You will need it so the dish is not too dry. And just like the last time I will be using the leftovers for a frittatta later in the week. In a large skillet, heat half of the butter and oil over medium heat until butter is melted. Add onion and cook, stirring frequently, until translucent, about 7 minutes. Add speck and marjoram: cook, stirring, 3 minutes more. Transfer onion mixture to a plate. In the same skillet, lightly brown bread crumbs in the remaining butter; add onion mixture and stir to combine. Remove from heat, and cover to keep warm. Bring a large saucepan of salted water to boil. Add spaghetti and cook to al dente, reserve some of the pasta water; drain. 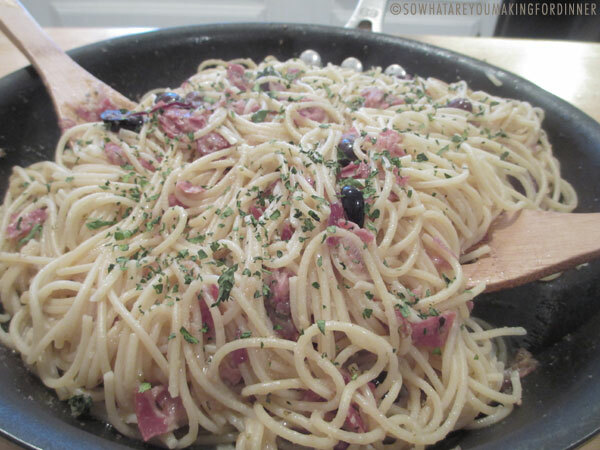 Transfer spaghetti to skillet with onion mixture, toss to combine, adding some pasta water if necessary and season with salt and pepper to taste.